A minute's silence will precede all Premier League and Football League games on the weekend of 25 and 26 April to mark the 30th anniversary of the Bradford City fire. 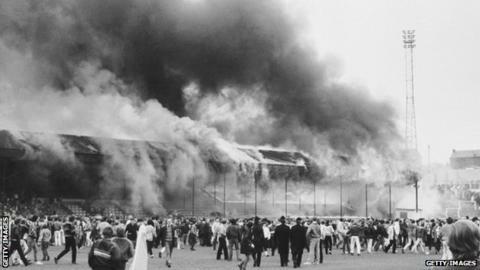 Fifty-six fans, including two from Lincoln City, died in a fire in Valley Parade's main stand on 11 May 1985. It is thought the fire was started by a lit cigarette dropped under the all-wooden stand. The date coincides with Bradford's last home match of the season. The Football Association, the Premier League and the Football League will also support efforts to help raise £300,000 for the Plastic Surgery and Burns Research Unit at the University of Bradford. FA chairman Greg Dyke said: "Next May it will be 30 years since the terrible tragedy that cost 56 people their lives when a fire destroyed the main stand at the Bradford City v Lincoln City match at Valley Parade. "It is important that football comes together to mark the tragedy and remember those who lost their lives. "The Football Association sends its sincere condolences to those families and friends affected by the tragedy." Mike Thompson, chair of the Bradford City Supporters' Trust, added: "This terrible tragedy took the lives of 56 football fans, injured hundreds more and deeply affected countless others throughout the whole of the community in ways that can hardly be imagined. "People recall the events of that day and the subsequent physical, mental and spiritual healing in their own way. "As 2015 marks the 30th anniversary of that awful day, it would be very supportive if the football community could join us in a dignified commemoration."